In a selection of Chicago factory postcards, the Charles Bruning Company offers a good place to start. The company’s frequent moves provide a textbook example of industrial relocation common among firms throughout the metro area. The Bruning Company also provides a glimpse into a small segment of Chicago’s once-dominant printing industry. 1940s drafting leadholder manufactured by Charles Bruning. 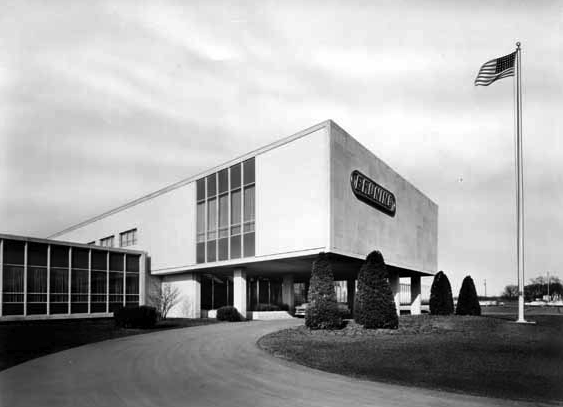 Left: 1959 Charles Bruning ad features the new Mount Prospect location. Right: Current view of the former Bruning factory on Montrose. Left: The Mount Prospect Bruning plant when new. Right: Now owned by Bosch, the building has been heavily altered. Time has been kind to the former Charles Bruning plant on Montrose, especially when compared to the alterations of the newer Mount Prospect plant. Unlike similar factories of its age, the Montrose Bruning factory remains quite intact. Many details visible on the postcard are still present. The entranceway remains strikingly original, sans the former Charles Bruning lettering. A loading dock has been added to the right of the entrance, but the ribbon windows remain intact, a rarity on structures of this type. Currently in use by an imports company, this excellent example of Art Moderne factory architecture remains well cared for and will hopefully be around for generations to come. As for the Charles Bruning Company itself? Merged with the Addressograph-Multigraph Corporation in 1963, it later became known as the Multigraphics division of AM International.5 At some point the Mount Prospect plant was closed, as it was later used by 3Com and currently Bosch. Unlike the intact plant on Montrose, the Mount Prospect plant (above right) has been heavily altered with a new facade, and retains very little of its original design. This article was last updated on Monday, June 1st, 2009 at 11:01 pm.